Not too many generators can provide 9600-watt power for 10 hours. But this Honda-powered 3 phase generator is in a class of its own. 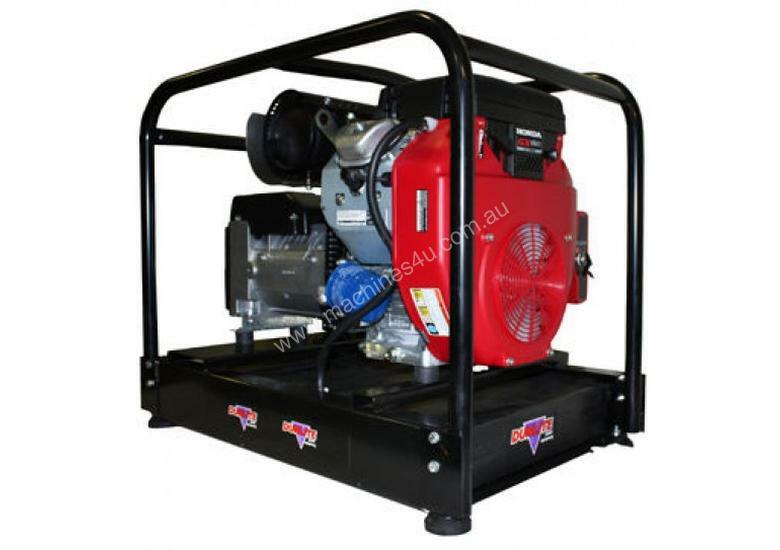 The generator is fitted with a massive 25-litre long-range fuel tank perfect for the construction, hire and farming industries.The reliable Honda GX630 3-phase engine starts easily with electric start and at a peak output of 11kVA, its a good choice for larger welders, compressors and other heavy duty equipment. As well as one 3-phase and two 1-phase outlets, the generator comes with the option of add-ons including a remote start, wheel and handle kit, and earth leakage protection.The package is complete with a 2-year generator warranty backed by a national service network. The Honda engine comes with a 3 year warranty. Note the unit is primarily a Three Phase machine - whilst it does provide single phase (240 power) as well, this is one third of the peak Three Phase output.RRP: $5,570Save $771 (13.8%) off RRPVoltage415 volt (3 phase)Continuous Output9600 wattsAlternator TypeNSMEngineHonda GX630Starting MethodElectricFuel Tank Capacity25 LCont. Working Time10 hours (80% load)Noise 7m75 dBAProduct Dimensions (mm) LxWxH876 x 546 x 700 mm (L x W x H)Net Weight (kg)140.0 KgFuelUnleadedOutlets1 x 20A 5pin (3 phase), 2 x 15A (1 phase)Engine Warranty3 year engine warrantyManufacturers Warranty2 year generator warrantyNOTEThis is a portable air-cooled petrol generator designed for short term/standby applications. For prime/continuous power, a stationary water-cooled diesel generator is recommended.